Mankind was never intended to live underwater, but, after Hurricane Katrina struck the Gulf Coast, the city of New Orleans and those who did not evacuate in the face of the massive storm were subject to survive, sink or swim. Broken levees flooded streets and dwellings, quickly submerging the Big Easy into a nightmarish version of the lost city of Atlantis. The strong fought fast-moving currents and rapidly rising waters; the weak drowned. Bodies—dead and alive—floated together in a sea of detritus. The government’s effort to trawl the murky cistern sank to a human calamity as bottomless as the natural devastation brought about by the hurricane itself. Local and federal officials failed citizens in an outrage that has yet to recede with the surge that once swamped the land. 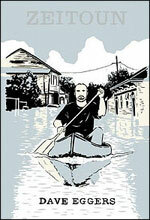 The true-life account of Abdulrahman Zeitoun, a fishing village native from Syria living in New Orleans who chose to ride out the storm, revisits the ire, zeroing in on a former mariner’s perspective of the days immediately prior to and the weeks following Katrina. While no single experience ranks more relevant than another, his tale knowingly ascertains one individual’s stratum in a vast ocean. He thought of bycatch. It was a fishing term. They’d used it when he was a boy, fishing for sardines by the light of the moon they’d made. When they pulled in the net, there were thousands of sardines, of course, but there were other creatures too, life they had not intended to catch and for which they had no use. A sardine, Zeitoun was not. An honest businessman skimming the grotesquely altered topography of his adopted homeland in a canoe and an aid in relief efforts, he became. That is, until crisis mismanagement, spawned from fears in a post-9/11 world, intervened. The compelling events are intimate and indicative of broader concerns all at the same time, snaring a difficult episode from U.S. history in fathomless, pointed criticism. This country was not unique. This country was fallible. Mistakes were being made. He was a mistake. In the grand scheme of the country’s blind, grasping fight against threats seen and unseen, there would be mistakes made. Innocents would be suspected. Innocents would be imprisoned. Throughout a surreal odyssey, Zeitoun confronts the barbarism intent on pulling him under. Nevertheless, indignation occupies no cove in his heart. Anger and shame are cast aside: giving up and lashing out at adversity characterize too primitive a response. A greater courage prevails. Societies can crumble—get washed away. In the best of us, however, the human spirit retains an admirable resiliency to prosper beyond ruin. Heaped within the bycatch are beings determined to persevere under extreme duress. Those relegated useless wade on and salvage a purpose. Amid the devastation of the city, standing on the roof of his drowned home, Zeitoun felt something like inspiration. He imagined floating, alone, through the streets of his city. In a way, this was a new world, uncharted. He could be an explorer. He could see things first. A man in the tank is not unique from a fish out of water. Natural selection links them in that, over the long-run, every genus fosters an ability to adapt into the best incarnation of its kind. Zeitoun takes an evolutionary leap, living in amphibian wonder.